Here we are, December 4th, and my first sweet wine of the 24-day wine advent calendar countdown. You might not want a sweet wine; it’s Sunday so you might be wanting a red with your roast. But let me get this out of my system because I love sweet wines. Here’s the story of this one. When I go to walk-round wine tastings with my pal Cambo, tradition dictates that we start with sparkles, then head for the whites, then the reds, then finally make a beeline for the sweetie table which is the biggest treat of them all. The sweetie this time was at a wine fair organised by the delightful Mike Stoddart, manager of Oddbins in Liverpool and was held in the Crypt at Liverpool’s Metropolitan Cathedral (nicknamed Paddy’s Wig Wam by the Scouse wags here). I’d done a visual sweep of the room when I arrived – where were the sweeties? 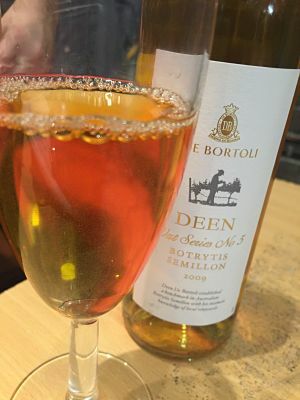 – and with ten minutes to go before “last orders” were called I headed to the Australia table and smiled nicely at the young chap pouring tastings of the De Bortoli Deen Vat 5 Botrytis Semillon. The smile worked a treat, as you can see. What is it: It’s a dessert wine. I love, love, love, love, dessert wines. Sauternes a couple of years ago. The wines are delicious in themselves (it’s odd that I love them so much because I don’t have a sweet tooth when it comes to food) but more than anything I admire the way these wines are made. Patience and skill beyond measure. And who on earth discovered that mouldy grapes could produce such amazing wines. Eeeeek!! Mouldy? Well, yes. Don’t look away in disgust just yet …. Botrytis cinerea is a mould which develops on grapes if the conditions are just right. It needs damp misty mornings and warm dry afternoons. The rot – known as noble rot – weakens grape skins, so the water evaporates, the grapes shrivel, and the sugars and acids intensify. The grapes are then hand-picked one by one over many days by incredibly patient people. The grape: Semillon – other grape varieties are also susceptible to noble rot. What of the taste? Oh my. It has aromas of marmalade, and apricots, and honey, and lemon citrus, and pear, and vanilla, and – oh – the taste – the same fruity sweet richness is offset by a cleansing acidity. Which sets you up nicely for another glass. Yummmmyyyy. The small print. It is 11% abv and was marked at £9 for the 37.5cl bottle on the Australia table. Mike tells me he still has about a dozen bottles in the Liverpool Oddbins shop but you might have to hurry. I’ve also found it here on Amazon for £45.57 for a case of six, which equates to about £7.60 each. And you don’t have to think desserts for this wine. It would be perfect next to slithers of blue cheese.